Canaries, DIY measuring devices, were installed around I. P. Pavlova, on the ground floor level. Data captured showed that particles matter values are above 300 mg/m³, which exceeds acceptable values stated by the World Health Organization. 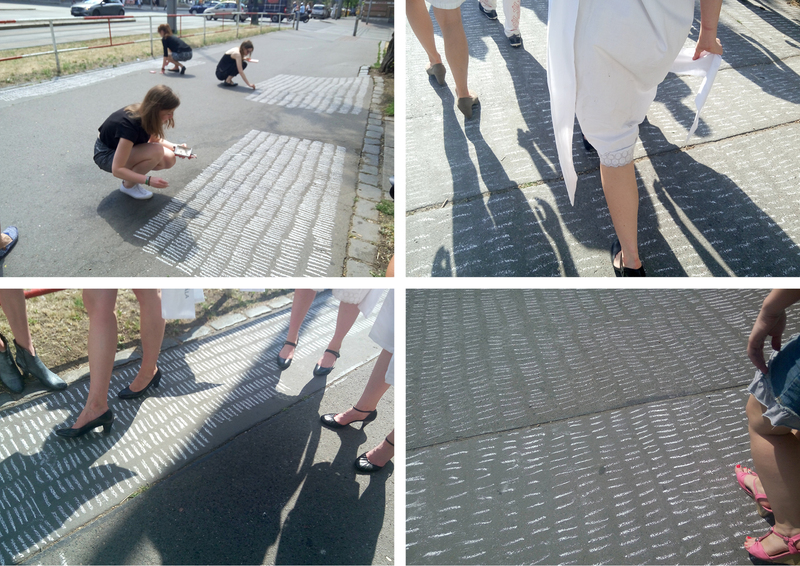 During the live performance, white lines were drawn on asphalt, in the I. P. Pavlova Square pedestrian areas, visualising data captured. Every 30 minutes a fashion show was organised, having 11 models walking through the cross paths in I. P. Pavlova square. Their white dresses, designed by dress designer Jitka Pospisilova, were previously exposed to air pollution in the same square, hanging them on the facade of a residential building for 2 weeks: their grey traces were a simple and very communicative system to visualise the amount of Particle Metter polluting the area. 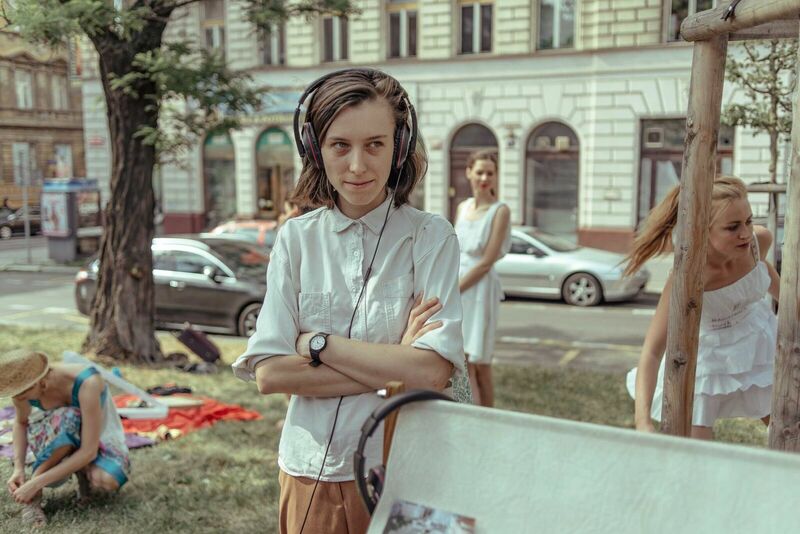 Each fashion show was accompanied by a special soundtrack: the artist Michal Kindernay created a sound map of the city’s driving paths, converting the sound registered on the Sokolská and Legerova road in electronic music, in order to raise awareness on the unbearable noise of a traffic junction in the middle of the city. Two info points have been organised in I. P. Pavlova square during the event: three people part of the Active Public Space project were explaining the contents of the event and asking people their opinions. They were distributing postcards illustrating the history of the square, the actual use of it and the process that lead to the organisation of the “Air – Motion – Sound” performance occurring in the square. 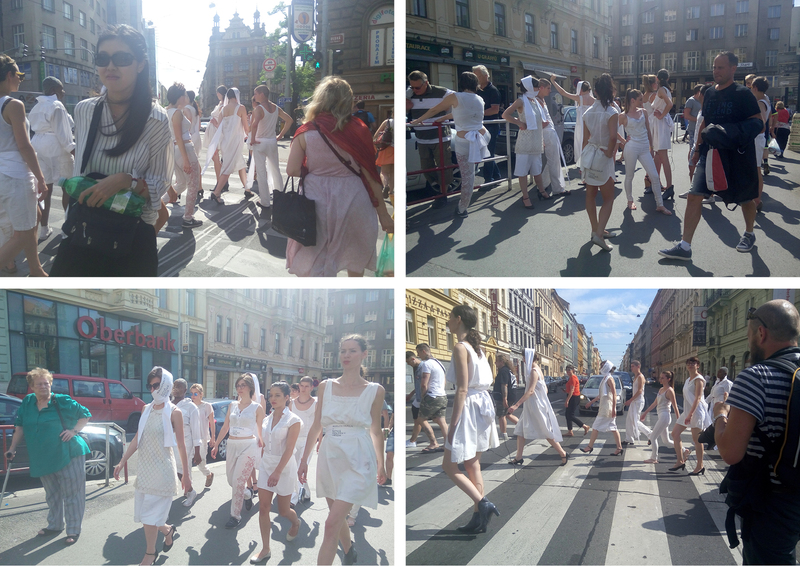 In detail, the postcards were showing ancient drawings of the original project of the square, almost only for pedestrian use, the actual status and the white dresses used for the fashion show hanging on a building on the square. 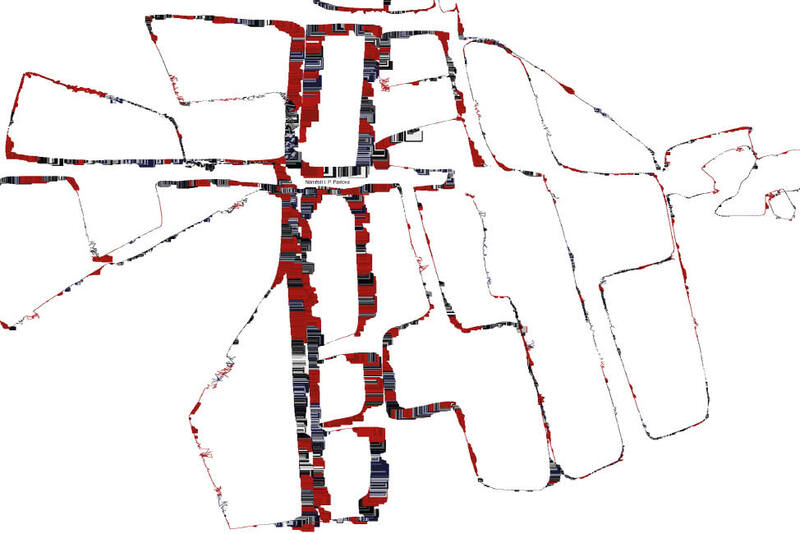 Moreover, Movement Illustrator Zuzana Bramborová created images visualising the square’s use. At the info point, citizens were asked to live their opinion on how to activate the square space leaving a post-it on a cardo-board panel. A picnic area where citizens were invited to discuss about the square use was set-up in the green area of I. P. Pavlova square. 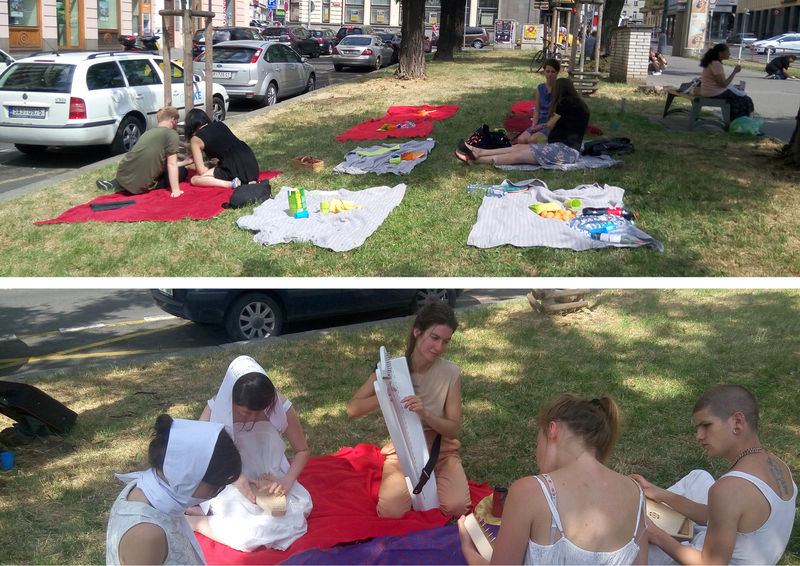 It included blankets with food, where people could rest and talk, accompanied by a harp performance of musician Kateřina Zochová. Moreover, pedestrians had the chance to immerse themselves in the silence that the square has the potential for, using special headphones transforming the noise of busy cars into relaxing music. 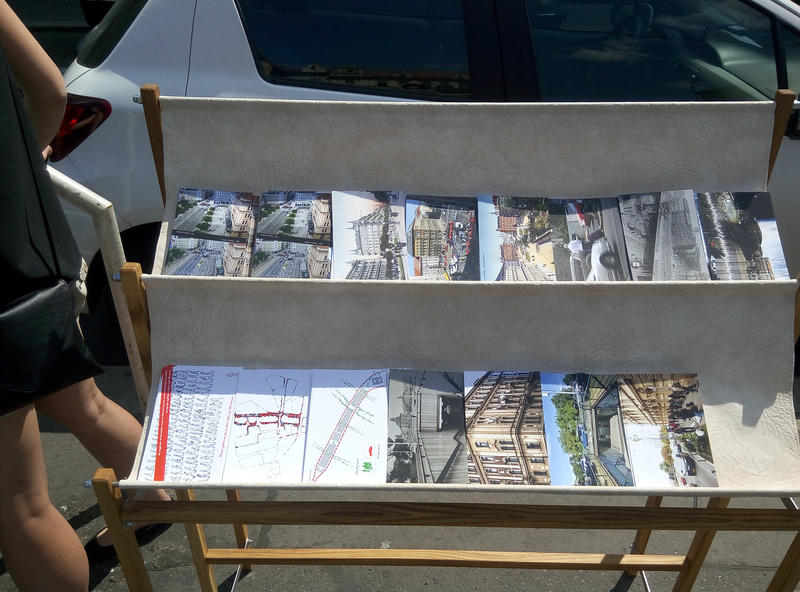 “Air – Motion – Sound” gave citizens the possibility to discuss with the citizens of Prague, who are passing through the area every day, the possibilities of improving the I.P. Pavlova Square and its transformation away from a busy intersection. 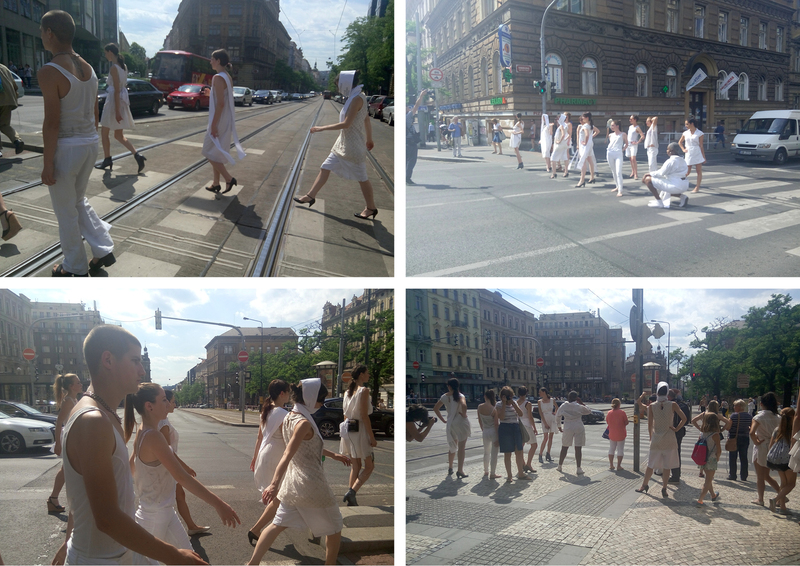 The performance lasted 6 hours and more than 20.000 citizens crossing the area were involved. * The data is based on the measurements made by the TSK in April 2013 within the 14-day measurement between 6:00am-10: 00 pm.